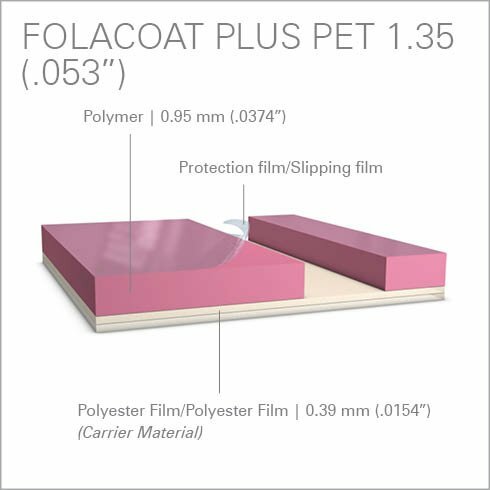 The coating plate for the transfer of water-based and UV coatings received a tear-resistant, double-layer polyester film laminate. This laminate reduces the risk of the carrier break for largest production runs, and ensures a long service life. 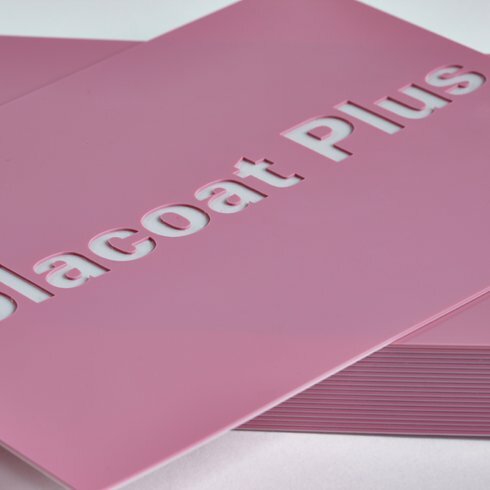 The pink-coloured, coating-carrying top polymer coating has received a protective / sliding film, to protect the coating plates against mechanical damage. This film allows trouble-free sliding of the cutting head by a CAD cutting systems and visualizes the applied cuts. The Folacoat Plus is now also available in roll-length 30m and 40m. NOMINAL THICKNESS 1.35 mm: Recommended cutting depth: about 1.05 mm (.041”). If you like to remove the slipping film before cutting, reduce depth by 0.05 mm (.002”). The polyester film in the middle helps to avoid deformations of the carrier-film below. A thin white line on the back indicates that the cut went correctly through the polymer and slightly into the polyester ensuring the correct depth has been reached. This now means the correct stripping performance will be obtained without partial lifting of the remaining polymer areas.